e-Government develops over time. Researchers want to track this; practitioners want to benchmark where they are in relation to others. The result has been the development of e-government maturity models. But there are difficulties with the most popular models, and here I propose an alternative. There are many e-government maturity models: Fath-Allah et al (2014) provide a helpful overview that identifies and then analyses 25 different models. 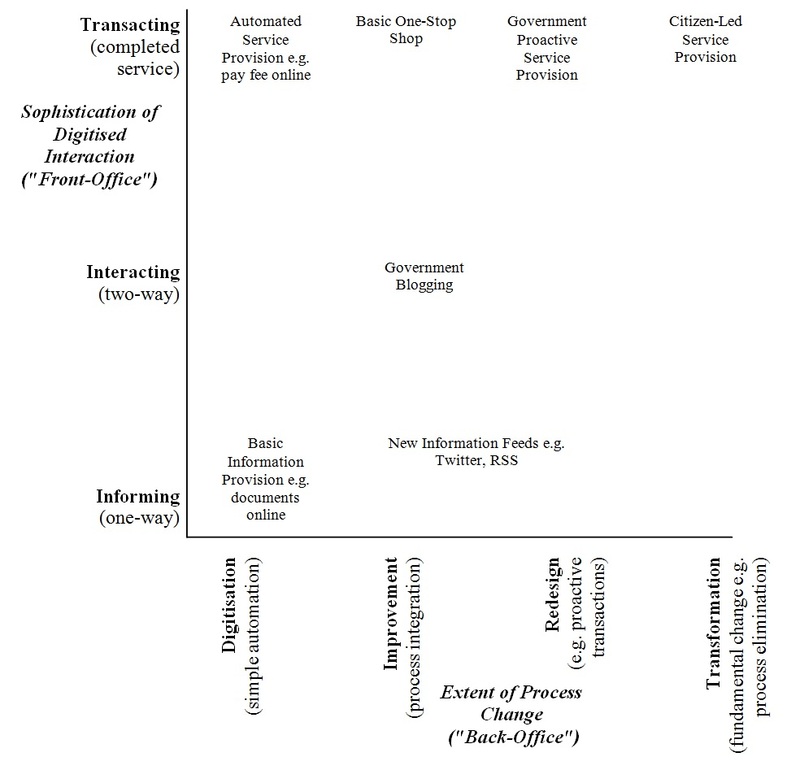 By far the best-known is Layne & Lee’s (2001) four-stage model (see below): not just the most highly-cited model but the most highly-cited of all e-government papers. 1. US-centricity. All models are a product of their context. Layne and Lee’s model derives solely from e-government experience in the US. As a result – even 15 years after its development – the model focuses mainly on higher levels than actually achieved by most governments worldwide; at least judged on the basis of the UN e-Government Survey (e.g. UNDESA 2014). To address this, it will be useful for a revised maturity model to disaggregate two pre-transactional stages; one related to one-way publication of government information; one related to two-way interactive capabilities of e-government. 2. Beyond Integration. All models are a product of their time. 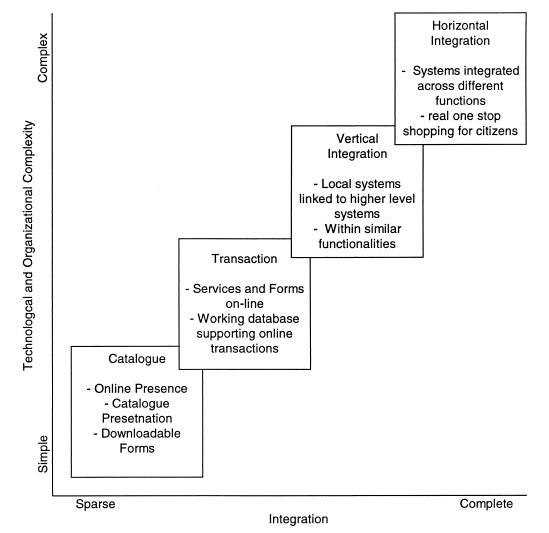 At the time Layne and Lee were writing, it was perfectly reasonable to identify integration – joining up e-government services vertically across levels of government, and horizontally between sectors of government – as the pinnacle of e-government’s achievement: the completion of all of a citizen transaction online. Subsequently, however, e-government has moved beyond this. Maturity model designs that move beyond integration are therefore the focus for a number of the revisions charted by Fath-Allah et al. One example now visible is government undertaking a transaction proactively; e.g. proactively reissuing a passport when the old one nears renewal or an auto license with payment set up via an automatic direct debit mandate. Or, governments now customise processes so that services are individualised; e.g. providing personalised information matched to the known needs of the individual citizen. Or, governments may even eliminate a process, no longer requiring anyone to do it; e.g. government proactively issuing a birth certificate from hospital records so the citizen no longer needs to register a birth. These types of further development need to be incorporated into any revised maturity model. 3. Disaggregated Dimensions. All models are a product of their mindset. Not just the Layne and Lee model but also its suggested variants have a single-path perspective on e-government maturity. At first glance this can be hard to notice since the Layne & Lee model plus some variants is illustrated within a two-dimensional space. But that space is not used: these models are functionally-equivalent to a one-dimensional ladder model. As a result, there is no differentiation between the “front-office” nature of the interface / interaction, and the “back-office” nature of the underlying process. Yet these can progress at different rates. Some e-government applications are quite transactionally complex but not integrated with other services. Other e-government applications – such as a number of government portals – are simple in interactional terms but integrate across all of government. A revised maturity model should take this into account, and provide a truly two-dimensional space within which e-government can mature. It reflects current global realities of e-government by having separate categories for “Informing” (one-way publication of information) and “Interacting” (two-way communication between government and users). The extent of change in underlying government processes includes the Layne and Lee components via categories of “Digitisation” (simple automation of existing processes) and “Improvement” (bringing processes together via horizontal or vertical integration). But it then moves beyond these to more fundamental process change via categories of “Redesign” (such as proactive or customised transactions) and “Transformation” (complete reworking of processes such as their elimination or reversing from government- to citizen-led). Delinking front-office interaction from back-office process change. The figure below shows the model, including some examples at various different points in the maturity space; with growing maturity understood to be movement from bottom to top, and left to right.